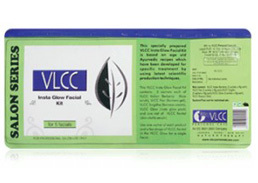 Buy VLCC Insta Glow Facial Kit. Instant brightness and radiance for all skin types. This Kit contains 5 sachets each of Indian Berberry Face Scrub, Saffon Massage Gel, Snigdha Face Cream, Insta Glow Face Pack plus one vial of revital. Use one sachet of each product and a few drops of revital in the Insta Glow Face Pack for a single facial. This soft & creamy pack with Lavender and Rosemary, brightens the complexion, giving it a characteristic luminosity, radiance and softness. This cream is enriched with skin-lightening co-agents like Mulberry and Lemon peel extracts that lightens skin pigments without dehydrating the skin making it visibly fairer and radiant. This Ultra-light gel combines Mulberry and Saffron extract, which lightens and brightens the skin and improves its texture. This remarkable product exfoliates and rejuvenates, porcelains and retexturises, cleans and refreshes the skin. Date extract and Papaya deep cleanses and moisturises the skin. Clean the face with suitable cleanser. Take appropriate amount of scrub and apply evenly on clean skin. Leave it on for 5 minutes, then massage gently with wet fingertips. Wipe-off with moist cotton. Massage gently with wet fingertips for 8-10 minutes in circular and upward stroke still the skin absorbs it. Apply cream generously on clean skin. Massage gently in upward and circular strokes for 10 minutes. Wipe off the excess. Mix few drops of VLCC Revital (Skin vitality Serum) in Insta Glow Face Pack. Apply evenly on clean skin. Leave on for 10-15 minutes. Massage gently with wet fingertips, rinse off and pat dry. This treatment will leave your skin hydrated, soft, nourished, refreshed, toned, glowing and healthy. ALways wear a sunscreen with an SPF of at least 15 plus UVA protection (read the label) when your skin is not covered. Avoid the Sun in the middle of the day. Remember that cloudy weather doesn't protect you from the sun's damaging rays. Stay out of tanning booths. Eat lots of fruits, vegetables and foods that contain antioxidant vitamins that prevent cell breakdown. Keep your body fit and toned with excercise. Don't smoke and avoid passive smoking as much as possible.